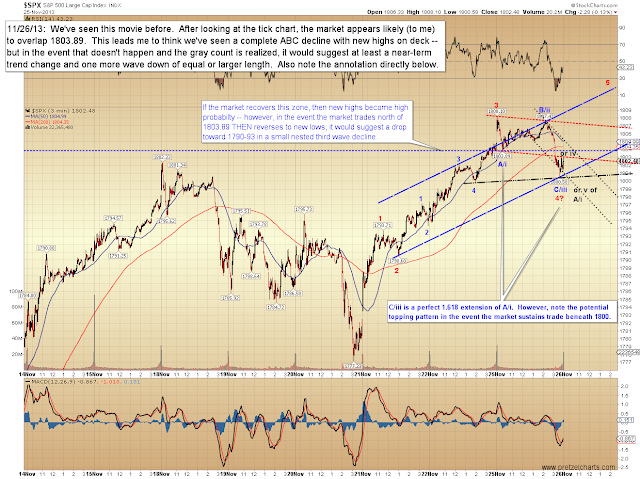 Pretzel Logic's Market Charts and Analysis: Is it Time for Caution Yet? Is it Time for Caution Yet? On Monday, the S&P 500 (SPX) rallied to within one point of my standing upside target and stalled. The question everyone seems to be asking now is "was that it?" Today, we're going to take a somewhat ambitious look at multiple degrees of trend, from the very near-term to the very long-term. I can't promise to get all of these right. I always think of long-term projections in terms of "leverage" -- the market's a dynamic environment, things can change dramatically from week to week, so a moderate change this week or next can leverage itself into a larger change over time. It's interesting that bears seem to be capitulating with greater frequency lately. I find the mass sentiment shift which has been occurring recently to be of interest, since such things are sometimes precursors to a big shakeup in the market. Let's start with the near-term chart and build from there. The first chart is the SPX 3-minute chart. Right now, the market has formed three waves down, which is a corrective structure. This would be an excellent place for the correction to complete -- however, if it does go on to become a five-wave decline (gray iv and v), then we'll have to anticipate that the near-term trend has shifted and expect it to be followed by a bounce and another leg down. 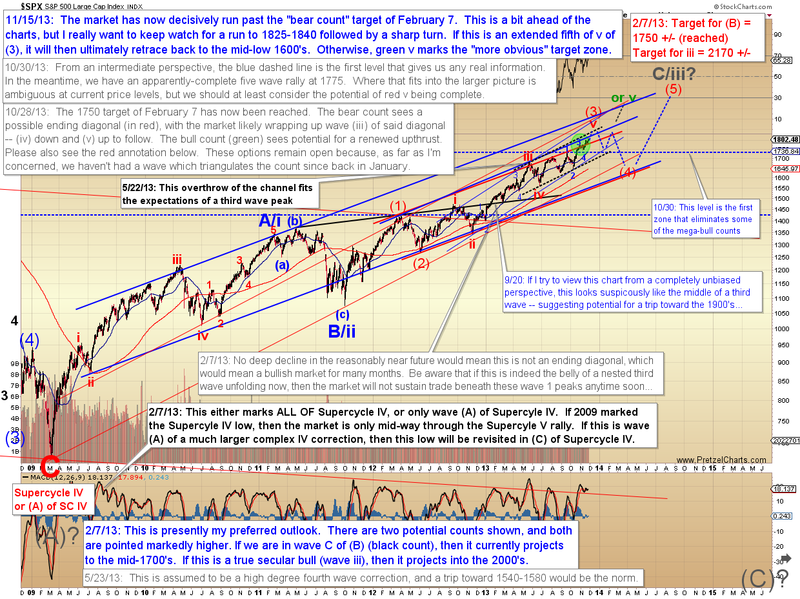 As noted above, the near-term chart leads me to believe it's probable there will still be a move up into the "official" 11/14 target zone. The 30 minute chart is starting to show some warning signs that the rally may be tiring, though more action is needed to turn those early warning signs into more significant signals. Maybe the best way I can state it is as follows: the market is in the midst of a wave pattern which dictates that alternate counts with larger top potential need to at least be considered and watched. 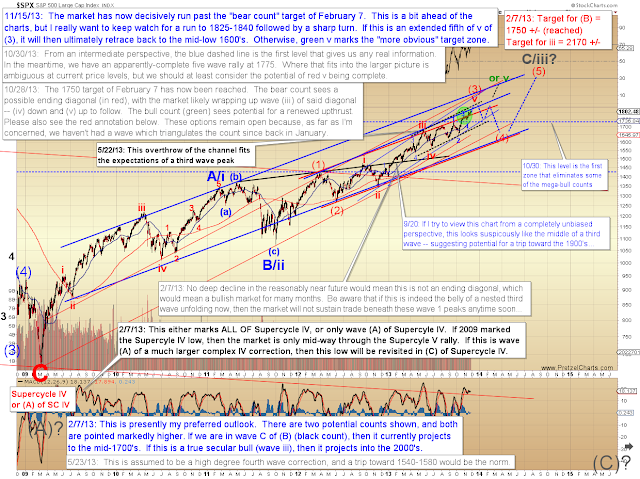 If one of the alternate counts is to become reality, though, we should start to see five-wave impulsive moves to the downside as early indications, which would then suggest we adjust projections accordingly. As you can see on the chart below, my preferred count is unchanged, and still rather aggressively attempting to anticipate several more bull/bear shifts (the last few portions of the projection have already come to pass). As I stated earlier, I can't promise I'll get all of these right this far ahead of time, and they may need to be adjusted in real-time. 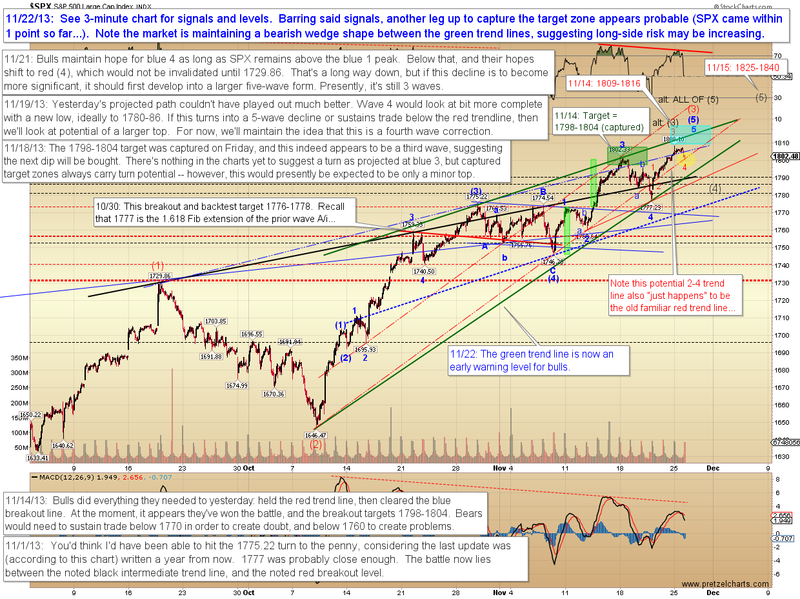 It is possible wave (3) completed at 1808, but I feel the structure would count better if it made another thrust up into the target zone. The daily chart is unchanged from November 15, and in a perfect world, I would still like to see the market stair-step its way up into the 1825-1840 zone. In conclusion, at this exact moment, I'm still inclined to favor higher prices. However, I am also presently of the opinion that the pattern suggests we're nearing a more significant corrective phase ("nearing" in terms of price, not necessarily in terms of time). The last few moves were fairly straightforward to me, but I think things are going to get a bit more interesting relatively soon, and am prepared to adjust and update the projections as needed. Trade safe.